Do you need more Tools? 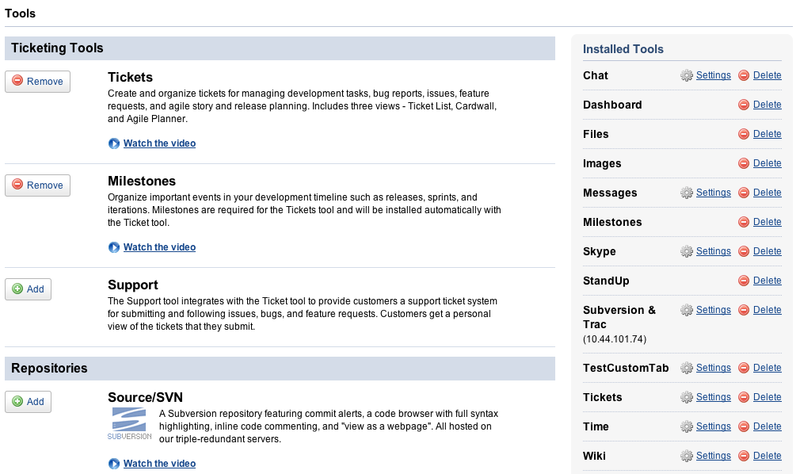 Assembla offers 20+ tools to accelerate your project. You can add or remove tools by going to the Admin Tab, clicking on Tools, and adding and removing tools accordingly. 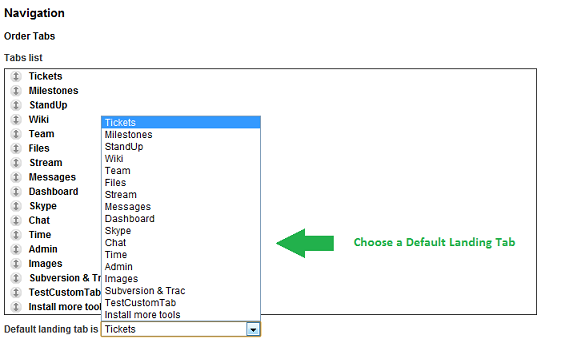 You can also easily access the settings pages for each tool for the "Installed Tools" sidebar on the right side. Assembla allows you to set a default landing tab for your space so team members accessing the space will land on a particular tool, typically the tool that is used the most. You can do this by going to the Admin tab of your space. Then scroll down and click on Appearance, and in the Navigation section you'll find the option to select a default landing tab from the list of your current tabs as shown below. 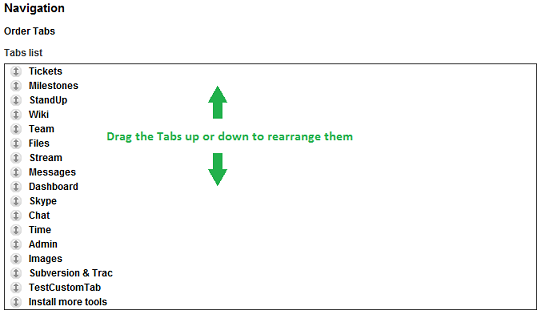 Arranging the order of tabs to be displayed in your space it's very simple. You can do this by going to the Admin tab and clicking on Appearance. Under Navigation you'll find the option to rearrange the tabs. Just click on any tab and drag it either up or down the list according to the order you want it to be displayed. Assembla allows you to set the frequency of the email alerts and the events for which your team members will get emailed. To set global alerts go to the Admin Tab of your space, then click on Email Alert Settings and choose the email frequency (when an event happens, hourly or daily summary, never) and the events you want your team member to get emailed about. Setting the Email Alert Settings will globally define what new users to the system receive when they are added. Once added, each user can change their personal settings from the Email Notifications subtab of the Stream tab. Note that changing the global Email Alert Settings will not affect the settings for existing users already in that space, only for new users added after you make the change. You can override these default permissions by adjusting access for each tool individually. To do so, click on that Security link in the Admin tab and at the bottom of the page you can use the "Custom Permissions for each Tool" section to adjust permissions for each tool in your space.